The Royal Mint's Lunar Series, also known as the Shēngxiào Collection, was launched in 2014 and is the strongest competitor of the Australian Lunar II Series from the Perth Mint. The 2017 gold coin commemorates the Chinese Year of the Rooster and is the fourth in this exciting collection of British bullion coins after the Year of the Monkey (2016),Year of the Sheep (2015) and Year of the Horse (2014). 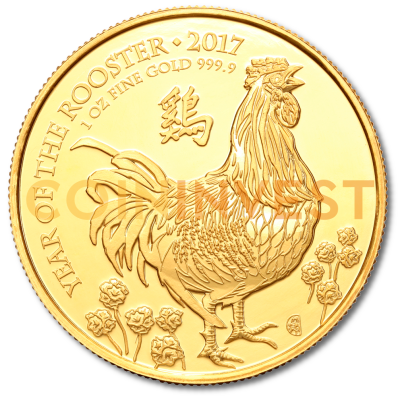 Like previous Lunar Series releases, the 2017 Gold Rooster will have a strictly limited mintage. To date, all coins in the series have featured a contemporary design based on the animals of the Chinese Zodiac by British- born Chinese artist, Wuon-Gean Ho. The 2017 Rooster is no exception and a Marsh Daisy Rooster is depicted standing among 10 marsh daisies. The number ten is the symbol of perfection according to Chinese culture. Each coin also features the number eight which is the symbol of luck. The obverse features a portrait of HM Queen Elizabeth II. Why buy gold Lunar UK Rooster? Gold is a very safe choice for investors and many people choose bullion coins as part of their pension plan. As legal British currency, the 2017 UK Lunar Rooster has the added advantage of being CGT-exempt. Each coin is struck from .9999 (24 carat) purity gold and the 2017 Gold UK Rooster is available as a 1oz, 5oz or 1/10oz coin. Coininvest.com is delighted to offer its customers the 2017 Lunar UK Gold Rooster. A smart way to add fine gold to your stock portfolio, this outstanding bullion coin will also be the focal point of your collection. Why not show it off to its best advantage with one of our specially designed display cases?